The effects of the 2008 financial crisis on the average American’s savings—and the emotional impact of those effects—have contributed to the push for financial reform. The effects of the crisis on retirement savings for those in defined contribution plans have been well documented, but the effects on defined benefits plans have been less apparent—until now. How has the crisis affected employees in state and local pension systems? What measures have pensions taken to defray rising costs? In January 2017, the Center for Retirement Research at Boston College released findings that identify common trends and document the reforms to state and local pension plans. 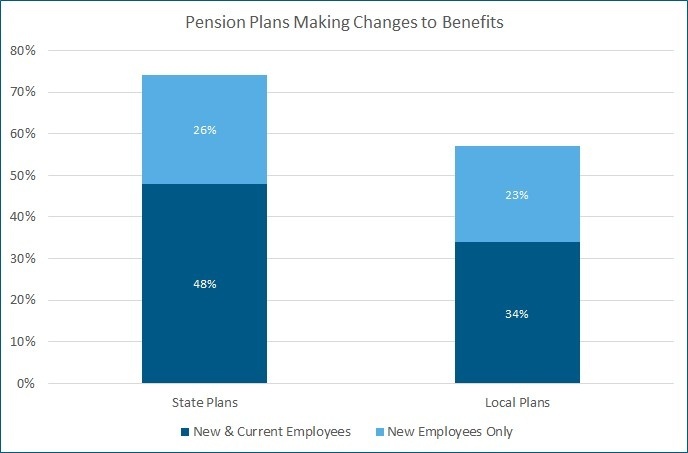 The researchers studied all the major state-sponsored plans and 132 local pension plans, including the largest local pension systems in each state. They studied plan reforms between 2009 and 2014. The types of reforms that they identified include changes to employee contributions, COLAs, benefit factors, the time period used in calculating the final average salary, retirement age, years-of-service requirements, and plan type (defined contribution versus defined benefit). They considered whether these reforms applied to all employees or only to new employees, and whether the reforms were implemented in states with pension reform legal protections. Understanding the interesting results of this study may aid you in helping public-sector clients understand whether and how the reforms will affect them. The research shows that 74% of state plans implemented reforms during the period. Almost half (48%) of the state plans made changes that would affect new employees. Approximately one-fourth (26%) of the state plans made changes that applied to all employees. In contrast, only 57% of local plans have enacted reforms. New employees bore the brunt of changes to local plans: 34% of local plans made changes that affected only new employees, and 23% made changes that affected all employees. The study contrasts the difference between the state and local plans (74% versus 57% making changes) and speculates that changes at the local level may be deterred by strong police and fire unions or economic impacts on smaller cities with high rates of public employment. Many states have legal protections that protect employee benefits and make it difficult to change benefit factors, years-of-service requirements, and the final average salary period. These protections can apply to already-accrued benefits as well as future benefits in many states. The most frequently cited changes for current employees were increasing employee contributions and reducing the pension COLA. 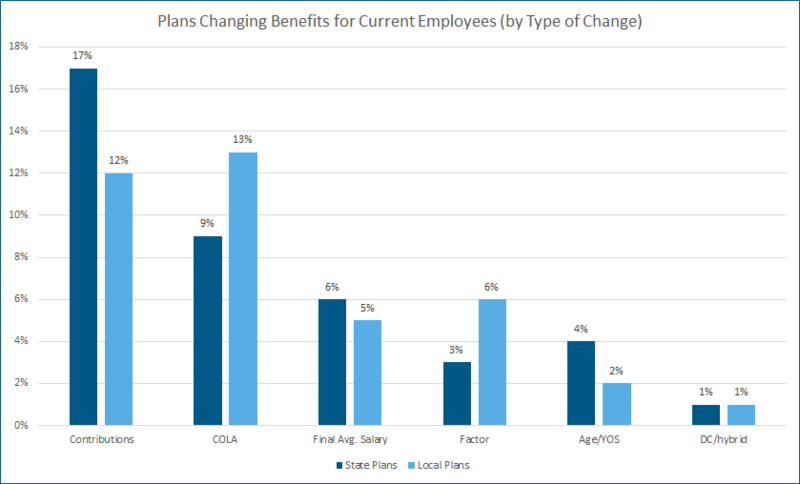 The reports states, “While the increase in employee contributions does reduce an employee’s net pension benefit (the portion of the benefit that is paid for by the employer), the prevalence of the reform suggests that it is viewed differently than direct reductions to benefits.” Many states do not view the COLA as a core benefit and thus COLAs have less legal protection. Among state plans, 17% increased employee contributions and 9% reduced the COLA. Among local plans, 12% increased contributions and 13% reduced the COLA. In a handful of cases, state and local governments actually reduced core benefits for current employees. The following state pensions reduced core benefits for current employees. No states offer legal protection for new employees’ benefits, so pension reforms for new employees underwent many more changes in core areas. 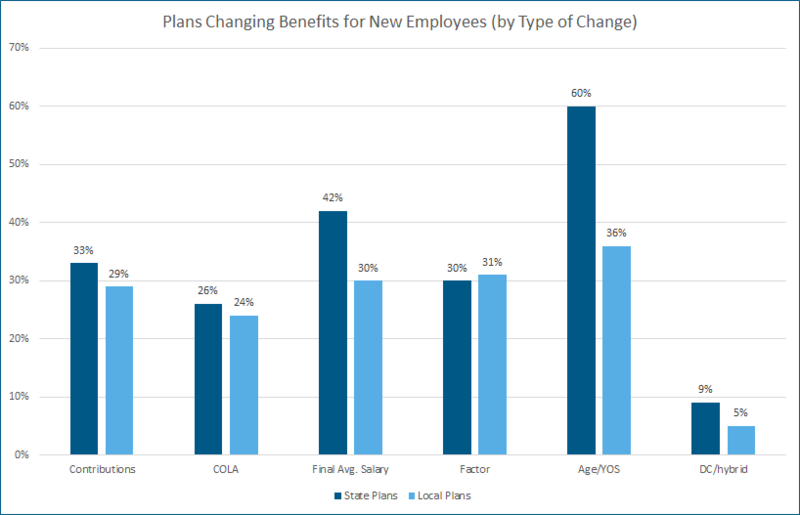 Among state plans, the top three changes for new employees’ benefits were increasing the tenure requirements (60%), expanding the period used for calculating the final average salary (42%), and increasing employee contributions (33%). Local plans underwent similar changes, with the top three being increasing tenure requirements (36%), changing the benefit factor (31%), and changing the period used to calculate the final average salary. Like everyone else, state and local governments were impacted by the financial crisis. In the push to reduce costs and fund budgets, many government employees will pay the price. Only time will tell how this ultimately impacts the growing movement away from defined benefit plans toward defined contribution plans and whether we will see more states offering defined contribution or hybrid plans. What seems clear is that those in pension systems may not be as secure in retirement as they had hoped. They will need advice on ways to improve their retirement readiness. Thank you to all you advisors who are serving our public-sector employees and helping get them get on track for retirement! If you are looking for help educating your clients about their pension benefits, Retire Ready Solutions has unique retirement software for the 403(b) and 457 markets to help you simplify the education process. Check it out today!